Soutzoukaki (pronounced soo-tzoo-KAH-kyah) comes from the Turkish word "soutzouk," meaning sausage, so it shouldn't come as a surprise that its spices are more Turkish than Greek. They've nonetheless been adopted by most Greeks as a traditional favorite. The cumin lends the meat a unique flavor. These spiced meatballs are shaped like little kebabs. They're lightly fried then bathed in a wine-sweetened tomato sauce. They hail from Smyrni or modern day Izmir. Soak the bread in some water in a medium-sized bowl. Add 1/2 cup of sweet red wine and let the bread absorb the liquid for a few minutes. Squeeze the liquid out from the bread, then tear it into small pieces and add it to the ground meat. Add the garlic, cumin, salt, pepper and eggs. Mix well to incorporate all the ingredients. 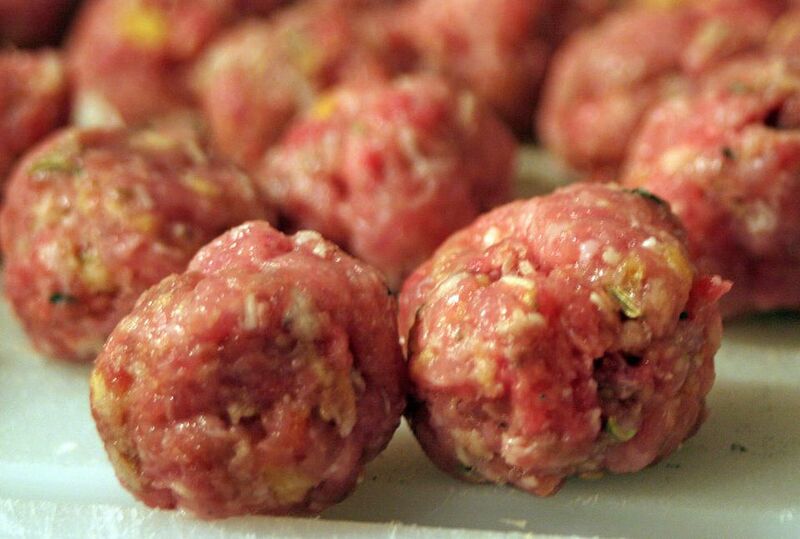 Using portions of the meat mixture about the size of a large walnut, form sausage-like rolls about 4 inches long and 1½ inches thick. Heat an inch of vegetable oil in a skillet and carefully add the soutzoukakia to the pan. Fry them until they're lightly browned on all sides. Drain on paper towels and set aside. Prepare the sauce in a Dutch oven while the soutzoukakia are frying. Add 1/4 cup olive oil to the bottom of the pan, then add the tomato sauce, sugar, cinnamon and the remaining cup of wine. Fill the empty tomato sauce can with water and add this to the Dutch oven as well. Boil the sauce over medium-high heat until some of the water has evaporated and the sauce has thickened. Add the soutzoukakia to the sauce when they've finished frying. Heat the sauce and the soutzoukakia to a boil and remove from the heat. Allow the sausages to sit and absorb the sauce for a few minutes before serving. Less cumin is always better than more. This spice can be strong and overpowering. If you're not a fan of canned tomato sauce, you can certainly make your own. Serve the soutzoukakia with potato puree, rice pilaf or fried potatoes. This recipe should make about 15 kebabs, depending on their size.